Throughout the years, U2 has collaborated with many fellow artists, from legends they admire to fresh talents emerging on the scene. One such artist is their contemporary — acclaimed musician/photographer/humanitarian Julian Lennon. In addition to photographing the band over the years, Lennon is a backing vocalist on the track “Red Flag Day” from Songs Of Experience. In the following interview, conducted via email, Lennon shares details of their history together as artists and friends, his contribution to their current album, and the thousands of photos he still has of the band, which have yet to be released. TK: When did you first meet/become friends with U2? TK: In an interview a few years back, you mentioned a treasure trove of U2 photos you took that weren't released because they were being saved for possible use on an upcoming U2 album. Since they don't appear on Songs Of Experience, will they be held for a future album or released in a different way? TK: If/when they're released, is there any chance of an exhibit of U2 works, exclusively? Is there any way to purchase any of your U2 prints that have already been displayed? JL: I’ve already had exclusive U2 exhibitions, one as part of my first-ever exhibition, at the Morrison Hotel Gallery in NYC. I’ve had many since with them in Europe too, in Paris, when they were also performing there. The “Timeless” Collection (U2 inclusive) has been available for sale and to view on my photography website since 2010. TK: I had the pleasure of interviewing artist Morleigh Steinberg in December, who co-owns the Arcane Space in Venice, California. She spoke of wanting to display a diverse array of artists/photographers. Any chance of exhibiting there (U2 content or not)? JL: I had the pleasure of dining with The Boys a few nights ago, and Edge mentioned this too … it’s always a possibility. TK: Fans were delighted to hear your backing vocals on "Red Flag Day.” How did the band approach you to work on that track? TK: Throughout your musical career, you've collaborated with several of your contemporaries. What's it like working with U2 compared to others with whom you've recorded? JL: Well, I’d hardly say I was working with them, as such, it was more like a little bit of fun for 5 minutes … The Boys are pretty low key when recording, and don’t often like having people around, so it’s always a pleasure to get the odd invite, if we’re in the same city, to hang out, talk about the World, and music, etc. etc. TK: Any chance of you joining U2 on stage when they (presumably) sing "Red Flag Day" on their upcoming tour? JL: Ha … Doubtful … If it was a “Proper” Duet as such, maybe there would be, or even an old classic like “Stand By Me,” which Bono and I have sung together now on quite a few occasions, but I think that decision is always last minute with Bono. He, and the rest of the guys, have to be feeling it, so to speak … I think it’s a show-by-show experience and decision. TK: Would you ever want U2 to contribute to any of your future songs? JL: I play them the odd song, here and there, listen to what they have to say … I think we’re both quite particular in our approach to songwriting, but never say never … who knows? TK: As a fan, do you have any favorite U2 songs or albums? TK: In addition to musical gifts, you also share a common spirit with U2 in the humanitarian sense. Your White Feather Foundation does everything from bringing clean water to African communities to preserving indigenous people's territories in Australia. Tell us more about your foundation and how our readers can help if they'd like to get involved. JL: In all honesty, the easiest way to know what we do, and to learn the story behind The White Feather Foundation is to go to our website, and read up on our projects … otherwise I’d be writing a few pages out for an answer. TK: Your new children's book, Heal The Earth, was just released. Tell us about it. JL: Well, it’s part of a trilogy to help children understand, in story form, the problems we face as a society, on a humanitarian and environmental level, and what we can do about those problems … but it’s more about starting a conversation with the next generation, at an early age, so they understand what’s happening to the world that they are going to inherit, and that there are possibilities for change, for the betterment of all life. TK: Heal The Earth is the second in a trilogy. When can we expect the third book to arrive? TK: At one point it was mentioned you may be writing an autobiography ... is that in the works? You seem to always have a lot on your plate. JL: I’m never not busy, one way or another. If I don’t have a project, or 2, or 3 on the go, at any given point in time, I start to worry that I’m not doing enough, for Myself, for My art, for the World. The autobiography is still a consideration, but I’ve just [got] too much going on to consider that as an option right now. TK: Fans of your Instagram feed (myself included) have really enjoyed your stunning photos from Cuba. Will those also become an exhibit? TK: What's the one question that journalists never ask you that you wish they'd ask? Lennon’s new book, “Heal The Earth,” will be released on April 3 and is available now for pre-order on Amazon. The third book in the trilogy will be released on or around Earth Day, 2019. 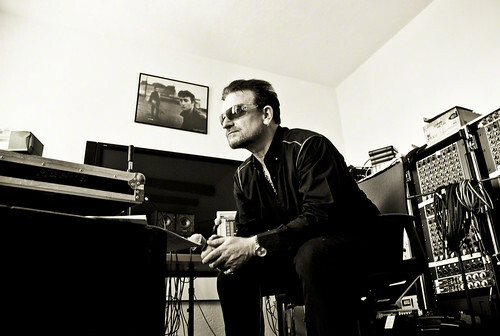 A direct link to his U2 photography is here.